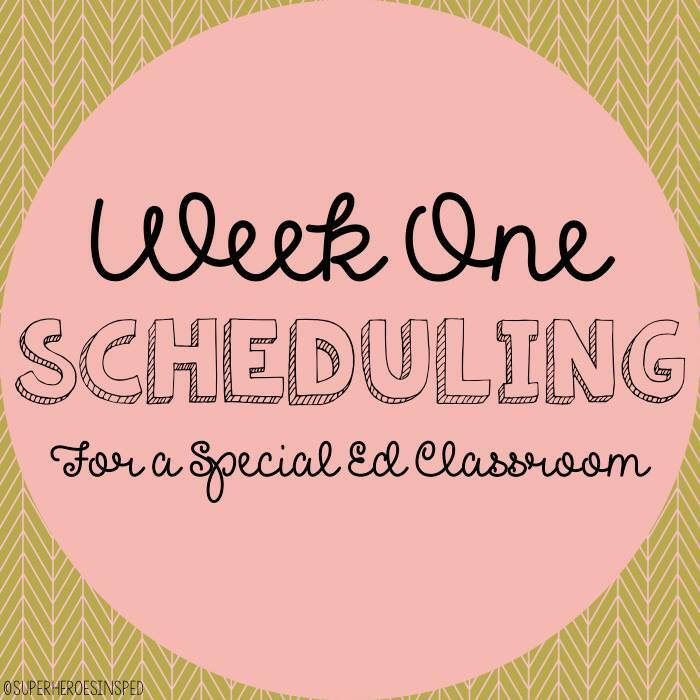 Welcome to week one of our Back to School Block Party: all about scheduling! 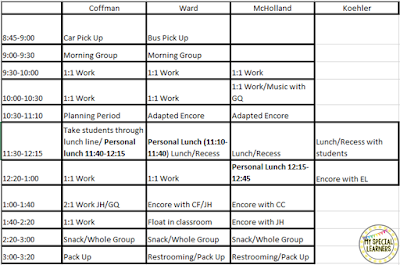 Scheduling for a self contained classroom is always a puzzle that I love to hate. It's so satisfying when I'm finally done, but then the school year begins and it changes approximately 238 more times, haha! I'm going to go through my steps to putting my schedule together each year. 1. Start with the basics. Above is a finished product of one of my schedules. When I start my schedule, I lay out the time slots and student names in an Excel spreadsheet. Once this is finished, I insert all of the non-negotiable times during the day such as lunch, recess, specials, students that go into regular ed, etc. 2. Make sure each student has 1:1 work time scheduled. If you notice above, each student has a designated 1:1 work time (shown in yellow) that I like to have set aside to work on specific IEP goals. This time is not always with me and is sometimes with a paraprofessional. 3. Schedule other center rotations. This is sometimes where it gets a little tricky for me depending on my caseload each year. During my day, I build in different rotations such as fine motor work, independent work, free choice, etc. Obviously, I can't have 5 students doing independent work at once because I don't have 5 independent stations! 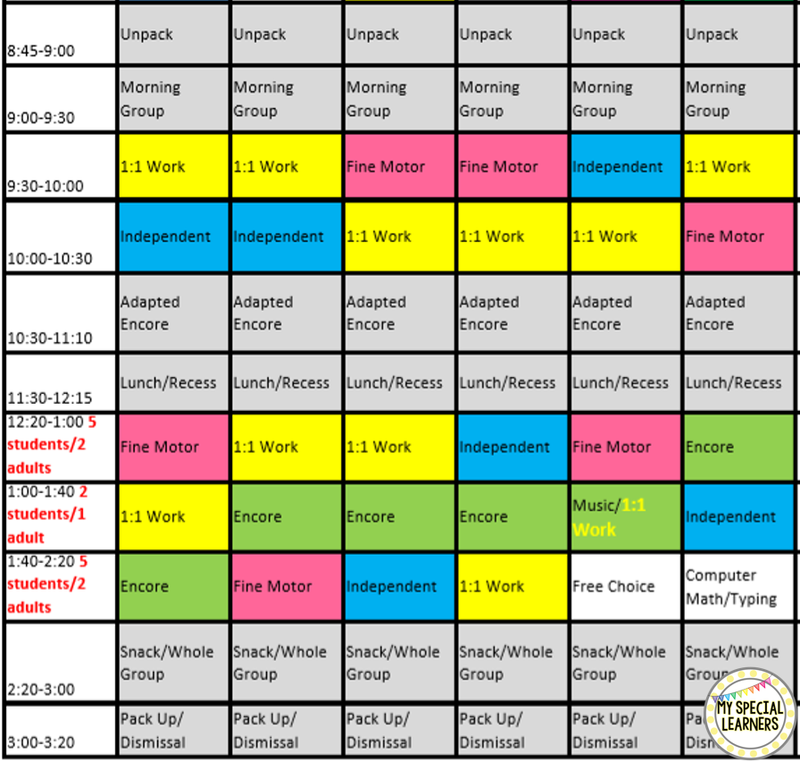 I now start working on scheduling each student during their open time slots at different center rotations. Color coding makes the schedule pretty, yes, but I do it for more reasons than to just look nice. Color coding the schedule helps me quickly see that everyone is scheduled for 1:1 work, independent work, or any other specifics that I want them to do during the school day. 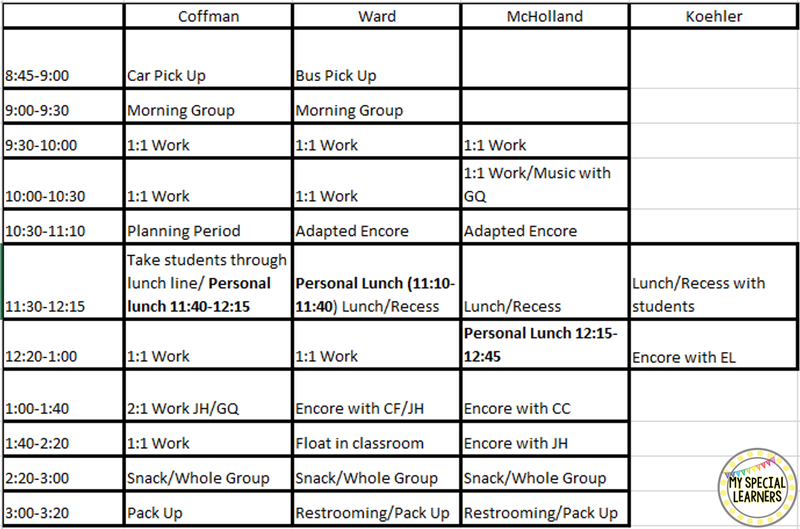 Above, you'll notice for this schedule each slot that is gray is a group non-negotiable that everyone participates in each day. Yellow is for 1:1 work, blue for independent work, pink for fine motor work, and green for encore (specials) with their regular ed class. 5. Make a schedule for your paras. Writing a schedule for your paraprofessionals will save you so much time and THEY will appreciate it as well. Would you want to go to work having no idea what you're going to do all day? Absolutely not. This is a great way to make sure you have enough hands during different time slots as well. This schedule isn't anything pretty, but it gets the job done. Everyone knows what they should be doing at all times which also limits down time for chit chat to happen! Do you write your schedule similarly? What do you do differently? I'd love to hear how everyone schedules their school day! 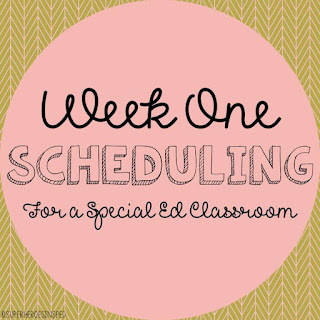 Click below to read on about how Stephanie from Mrs. D's Corner schedules for her class! We have the same type of scheduling system :) Except you plan much better for 1:1 and center time. I just put a general box, even though it counts as our 1:1 and center time. ...and 103948 times YES! on the schedule changes LOL! I love the idea of having a schedule for the paras. I think this would have saved me so much trouble last year!!! 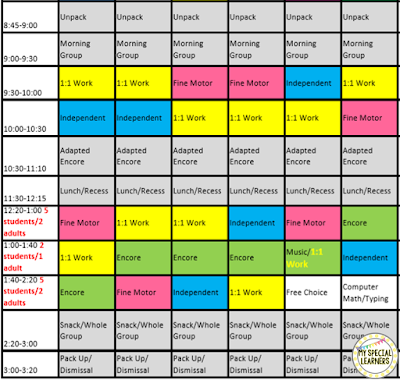 I use the same type of schedule..the only difference is that I use the colors to identify who is working with the student and above the students name is a color key with the specific teacher..so yellow for ot....green for para...blue for gym teacher...pink for me and so on...this way you only need one schedule! I teach in an emotional and behavioral disabilities self-contained classroom. What state do you teach in? How many students do you have? How many paras do you have? I have 9 students currently and am possibly going to jump to 13. I teach in Florida and was just wondering how different it is from state-to-state. My Scheduling is very similar and always changing as well! We also use the Unique and N2Y systems in our class which at this time is a whole per grad band (I have 2 bands in my room). I have to have Para schedules and last year was probably my biggest nightmare. I decided due to have some extremely needed students that rotating schedules would be our best option as to not wear my paras to thin through the year. I just colored schedules for them and then they rotated through them! I teach 6-8 and we are trying to transition into more of an inclusion process. With BRS,RF,RC,MC,MPS. Would this schedule work for that? © 2015 My Special Learners. Victoria Template designed by Georgia Lou Studios All rights reserved. Customized by Erin Hagey.